This type of food is my favourite thing about this time of year. Those recipes that are so quick to put together on a weeknight so you can sit outside and enjoy your dinner as the sun juuuust starts to set (although lets be real I’m probably sneezing 20% of the time because of all the pollen but OH WELL). Simple ingredients put together to make one delicious, perfect meal. This salad features one of my favourite carb-elements ever – sautéed potatoes. Is anyone else obsessed with them like I am!? They’re crispy on the outside and fluffy on the inside a bit like a roasted potato but a) faster to make and b) less dry, I find. The perfect addition to a salad like this in place of something like croutons to show you that potatoes are more than a bit on the side! Because hey, white potatoes get a bit of a bad rap in the ‘wellness world’ as people seem to demonise any carb which is white. But hello did you know they’re a source of fibre, especially if you leave the skins on as I always do! They’re also high in vitamin C and Potassium which are essential micronutrients. Potatoes themselves are naturally fat free so if you need to control your fat intake, they’re a great option. Something else people tend to overlook is that potatoes are very cheap so when you’re on a budget they’re a super accessible source of nutrition including the all-important carbohydrates that your body needs. Plus they’re locally grown in the UK & Ireland which is always a win! At the moment I’m loving them for dinner either par-boiled & sautéed like this (where I use floury baking potatoes) or boiled and cooled (where I’d use waxy/new potatoes). Toss them into a salad with a delicious vinaigrette, some pulses, seasonal veg & some leafiness. I’m not a fan of regular potato salad (too much mayo, not a fan), and I find that using differently flavoured vinaigrettes makes things more interesting anyway. I like to add different spices/fragrant ingredients to give the meal a Mexican/Italian/Japanese… twist without having to change much else. This recipe is a slightly more jazzy version of a standard tomato/basil/mozzarella salad. I’ve bulked it up with the crispy sautéed potatoes and cannellini beans so the dish holds it’s own as a meal. I drizzled in pesto and sprinkled on za’atar plus fresh basil for pumped up flavour. Lastly the burrata which, if you’ve never had it before, is basically a ball of mozzarella with cream inside so when you cut into it, you get a kind of creamy drizzle over the salad. 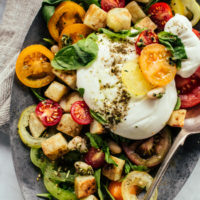 If you can’t source burrata/it’s too expensive (I’ve bought it for £4-5 per large ball from an Italian deli), just get yourself a nice large ball of mozzarella, tear it up and dot it over the salad; If you’ve got a splash of cream on hand, drizzle a tablespoon or two over as well! Bring a large pot of well-salted water to the boil. Wash the potatoes well then cut into ~3cm chunks. Drop them into the boiling water, bring the water back up to the boil and cook for 3 minutes. Remove the pot from the heat and drain the potatoes. Over a medium-high heat, heat a large frying pan with enough oil to coat the base of the pan well. Once the oil is hot add the potatoes to the pan and season with some salt - you don't want to crowd it too much so you may need to fry in 2 batches, depending on the size of your frying pan. Cook the potatoes until they start to turn golden underneath then turn them so all the sides become golden. Remove from the heat and set aside. On a serving plate, lay down the rocket leaves. Mix the cannellini beans, pesto and olives together in a small bowl and distribute over the leaves. Lay on the tomatoes and warm potatoes. 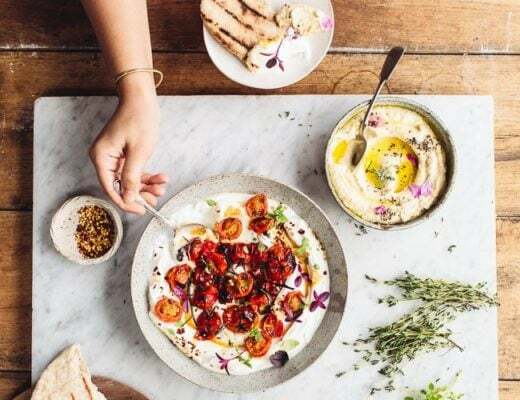 Place the burrata in the centre and sprinkle with the za'atar and basil leaves. Serve. - Za'atar is a herb mix containing dried oregano, sumac, sesame seeds and sallt. If you can't source it (I get it from the Middle Eastern grocers in London/Leeds) you can sprinkle on dried oregano instead or leave it out. 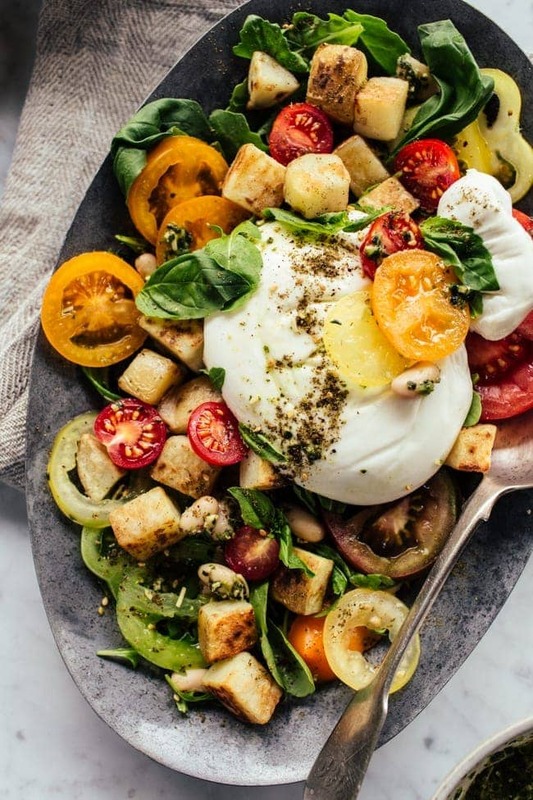 - if you can't find burrata, use a large ball of mozzarella cheese, tear it up and scatter that over the salad. 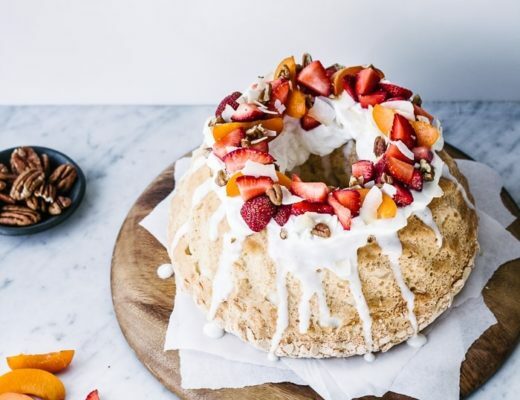 If you've got some cream on hand, drizzle 1-2 tablespoons over the salad too. Yay for potato love! 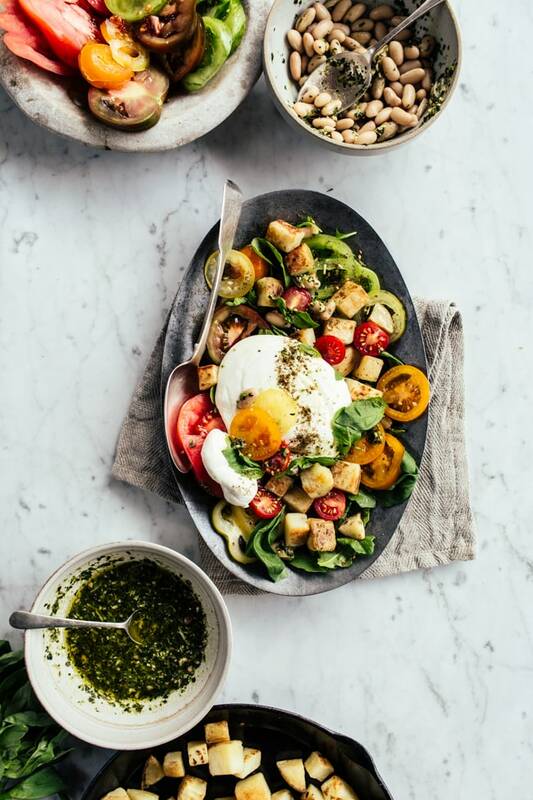 My day is always better when it involves a potato 😉 and this salad with all of the elements and flavors is so perfect for summer dinner hangs on the patio, Izy. Hope you are having just the best week girl, lots of love! This is the kind of salad that I love! !